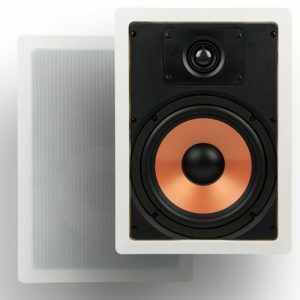 Different from wired floor speakers, in-wall speakers give an amazing audio experience without attempting to trip over. In-wall speakers are clutter-free and space saving. They deliver good-quality sound to any room in your home, or office without taking up too much space and blend well with any interior wall color and decoration. If you have little children, they may tip over wires and stand a risk of electrocution. Unlike traditional freestanding speakers, the in-wall speakers are not only good quality, but are also easier to set up. 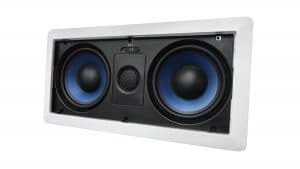 As the in-wall speaker uses the in-wall cavity as a speaker cabinet thus producing the best bass response. They also feature swiveling tweeters that allow you to direct frequency towards you. 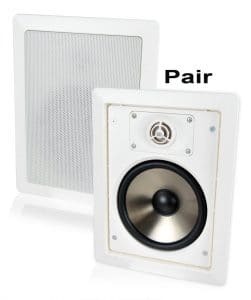 Most in-wall speakers are resilient and can be used for the longest time without needing constant repair and replacement. 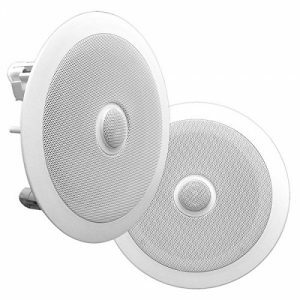 In most cases, you will find in-wall speakers suitable for use in various places. In addition, they are moisture resistant and can be used in bathrooms, saunas, and kitchen. Audio: The most important factor in judging an in-wall speaker is sound output. Look out for the quality of audio against the size and price and choose one that offers utmost value for your time, effort and space. Structure: The construction factor of the speaker is vital. It affects how it will fit into your wall and blend your décor. For this reason, it is wiser to choose one that is easy to install, paintable and can fit anywhere. Durability: In-wall speakers necessitate resistance to physical shocks and moisture. They are more susceptible to damage by stray objects or steam. Considering how expensive they are to replace it is important to choose one that will last long. Power handling: Power specification of a speaker normally expands on the maximum amplifier power a speaker can comfortably handle. In other cases, you will see the least power handling too. 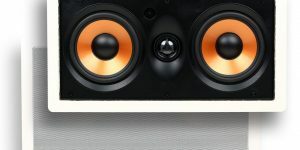 A speaker with the power of 20-100 watts is suitable for a 100-watt RMS receiver. Frequency response: Frequency response, in this case, is the range of human hearing and is usually about 20-20000 HZ. A frequency response also shows you what percentage of that range the speaker can play. 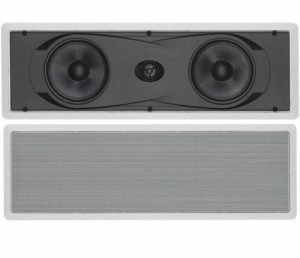 An in-wall speaker frequency response of 50-20,000 covers a wider range and produces a deeper bass unlike a speaker with a frequency response 65-20,000 Hz. Efficiency: A speakers sensitivity level shows how effectively it consumes power supplied to it by the amplifier. A speaker with a level of 87Db uses a lot of power to play loudly that a speaker with a level of 91Db. Budget: Generally In-wall speakers are a luxury. When it comes to budgeting, the choice depends on how much you are willing to spend. The best in-wall speakers will give you the maximum out of your money. Finding the best in-wall speaker can be a daunting task. Therefore, we carried out an extensive research and came across several brands with different prices. Judging from our audio experience we selected 10 best in-wall speakers that will be worth your every penny. Let’s have a look! 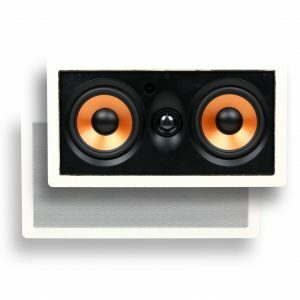 The Silver Ticket 2-Way In-Wall Speaker is a multitalented speaker that is meant for a wide range of audio and home entertainment applications. This speaker greatly brings life to movie action and music vocals. It is fit for 5.1, 6.1 and 7.1 home systems. With the included heavy duty, high strength magnets, you get a loud but not noisy speaker. This means that this speaker will not sound harsh when you turn it up since it maintains clarity all the way. This speaker is also designed for quality and offers optimal durability. In addition, it can be easily installed both horizontally and vertically to suit your sound set-up. It also features high-quality rubber edge that allows true, long-lasting audio accuracy and quality. The flip lever makes installing this speaker easy and secure. Lastly, it features a well built, moisture-resistant covering that allows it to be used in saunas, bathrooms or under outdoor eaves. The Micca 2-way in-wall speakers feature a high excursion 8-inch poly woofer and a 1-inch soft dome tweeter which is integrated by a 12D crossover network. The result is a smooth and natural audio with vigorous bass output for the best audio experience. It is designed to offer optimum performance with various home entertainment appliances. In addition, it is easy to install and paintable to blend with any décor. Last but not least, it is available in different sizes and shapes offering versatility and much-needed home audio solution. 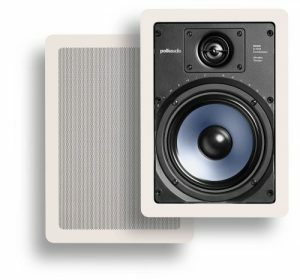 The Polk Audio RC65i 2-way In-wall Speaker offers astounding sound to any part of the house without using any shelf or floor space. This in-wall speaker is also very easy to install. Once installed, the grille and flange can be painted over thus allowing this speaker to blend well with the room. Furthermore, it uses a 6.5-inch dynamic balance with the rubber surround that is durable than form surrounds and a 0.75-inch dynamic balance metalized dome tweeter that features a swivel mount. All these components work to produce high-quality frequency sound throughout the room. 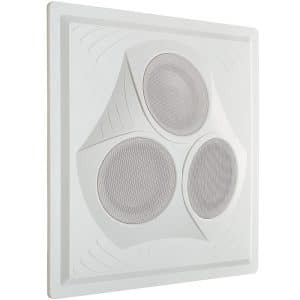 This in-wall speaker is made of durable, moisture-resistant materials which make it safe for use in kitchens, bathrooms, saunas or under outdoor eaves. Moreover, it features vast baffle tuning, which uses the enclosure of in-wall space to produce a greater bass response. The JBL In-Wall speaker features a 6.5″ titanium-laminate mid base driver that reduces distortion and a 1″ titanium-laminate tweeter for brilliant high-frequency sound. The result is loudspeakers that deliver not only powerful but also clear sound. In addition, it includes dog-ear brackets that are perfect for retro applications and comes with optional snap-together strong frames for new construction. This is another great in-wall speaker by Micca. It combines high excursion 8-inch poly woofer and 1-inch soft dome tweeter to provide optimal flexibility when it comes to configuration and suitability to diverse audio tastes. The M-8c is built with high-grade components and is scrupulously designed to deliver great value and performance. This speaker easily provides calm music background to loud 7-channel home theatre system. Additionally, it is easy to install and paintable to blend well with the presented wall color. This in-wall speaker is perfect when you want to add quality sound to your house without taking up too much space. The Yamaha in-wall speakers deliver incredibly good quality sound in a low profile design. It is also very easy to install and can mount flash against the wall. It features two 6-1/2″ cone woofers and a 1″ soft dome tweeter that work in unison to produce high-performance sound throughout the room. In addition, the speaker frame and grilles are paintable to match the already existing wall color. This in-wall speaker will definitely uplift your audio experience as you watch your desired action movie or listen to your favorite jam. This is another amazing in-wall speaker from Silver Ticket Production which delivers optimum sound quality. It features 6.5″ mica polypropylene cone woofer plus a 16.5oz magnet that delivers a clear and distortion free audio. In addition, it features a 20mm silk dome tweeter that has rubber edges and 15-degree pivot for smooth audio frequency and sound placement. Lastly, these speakers can also be used in kitchens, bathroom or saunas thanks to the moisture-resistant, solid constructed structure. 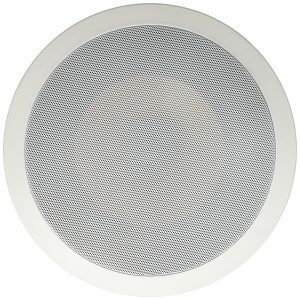 The Hemispherical Pure Resonance ceiling speaker’s coverage is 360 x 180. 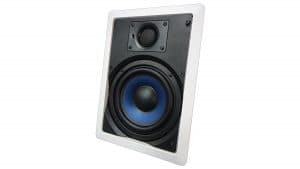 This speaker offers perfect performance and is ideal for classrooms, churches, corporate offices, conference rooms and much more. Additionally, this speaker uses very swift transient aluminum woofers that are stable and which provides clean dynamic sound. It is also uniquely designed to be fire retardant and can be painted to match any interior décor. Our top choice is this amazing in-wall speaker by Pyle that will turn around you listening experience. It greatly delivers sound to any room without encumbering the floor space. Moreover, it is highly compatible with 70V amplifier system and 8 ohm with direct 1-inch titanium dome tweeter. This powerful speaker boasts features like 6.5” round woofer, high-temperature voice coil, remarkable power handling strength and efficient response rate. All these components work together to bring you exceptional audio experience. In addition, installation is a breeze thanks to the included Cut-Out Template. Apart from being an in-wall speaker, it can also be used in in-ceiling application because it mounts flush for a spotless look and this is another reason that has earned it the number one spot. The other Micca speakers’ series have 8-inch poly woofers while this one features dual high excursion 5.25” poly woofers. The method of integration between the tweeter and the woofer is achieved by use of 12Db crossover network. The woofers work in harmony to produce smooth and natural vocals, bass output, and outstanding performance and flawless integration in case a subwoofer is used. It also features 1-inch silk dome tweeter that produces profuse detail and clarity for all sound sources. Additionally, the in-built mounting tags make installation easy and it can be painted to merge into any decor. A clean and classy interior finishing of your home or office greatly increases your asset value and also draws positive attention from the people you interact with. It is for this reason that you need to invest in quality in-wall speakers. Now that you are familiar with the best in-wall speakers, you can choose any of the above that we have listed and you will never regret it.